Ashes of Creation is an ambitious new MMORPG, the passion project of a millionaire businessman who set out to make his dream game, and it seems that his vision is catching on – the game has just blown past its $750,000 Kickstarter goal, less than 12 hours after going live. See what it’s rebelling against in our list of the best PC MMOs. You can check out that Kickstarter here, where there’s a thorough breakdown of the game and how it’s aiming to revolutionise the MMORPG. Its key promises are a living, reactive world, in which a volcano may erupt and flatten a city on one server, or lie dormant on another. Players will also be free to build (or destroy) new towns, marketplaces and castles. Such changes will be permanent, forever altering the game world and even its very landscape. There is a ‘node’ system to enable those changes, under which player activity adds experience to the node in which it occurs, with nodes levelling up as players do. With enough experience, a node “might become a village, a city, or with enough effort even a metropolis.” Players can then govern these population centres, “through democracy or through force”, making political decisions about how to develop the town. There will also be a local economy in each region, with resources unevenly distributed in set quantities, thus incentivising trade routes. Lucrative routes can be argued or fought over, or even plundered. You can learn more about the Node system in this dev blog, or in a two-part YouTube video (here’s part one, and part two). All this, as well as the usual MMORPG features of an epic story and a number of original races and classes from which to choose. These will interact with one another, with classes “changing the basic chassis” provided by core racial archetypes. “Our goal here is to create a system where an elven fighter feels different, but serves the same role as a dwarven fighter,” say developers Intrepid. Speaking of whom, Intrepid are a new studio full of experienced MMORPG developers, assembled by creative director Steven Sharif (formerly of XanGo, purveyors of fruit juices and other wellness products). Among the games on their collective CVs are Star Wars Galaxies, Planetside 1 and 2, XCOM: Enemy Within, EverQuest and its cancelled sequel, EverQuest Next. 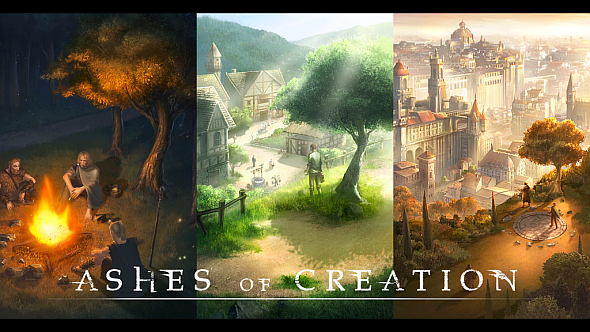 You can learn more about Ashes of Creation at its website. If you’re keen to support the game, you can still help push its Kickstarter to some stretch goals.